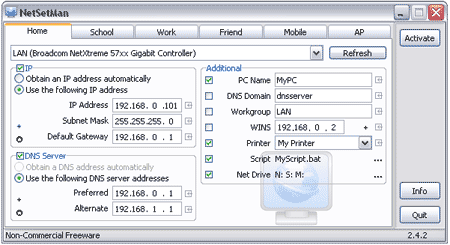 NetSetMan is a neat little FREE portable tool that allows a user to quickly and easily manage a network configuration on the fly. It’s great for those that might use a different connection to connect at multiple locations. You can set up to 6 different connection profiles and switch between them via a single click activate button. 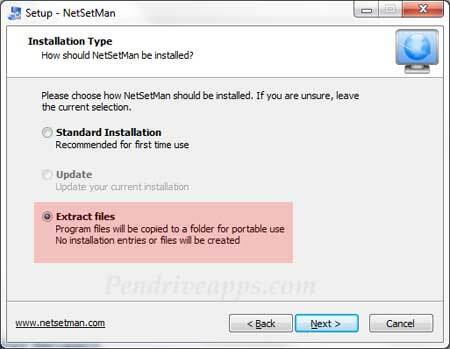 NetSetMan requires roughly 2.5MB for completely stand alone portable installation. Select the Extract Files option (for NetSetMan portable use). Click netsetman.exe from the NetSetMan folder to run the program.